Another big name in the navigation software has a solution for smartphones and PDA. 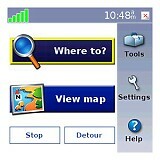 The TomTom Navigator 6 is the latest version of the software currently available for purchase on the company's web site. 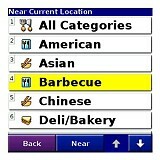 It is another easy-to-use program to offer voice and visual turn-by-turn navigation. It relies on Teleatlas maps and has detailed coverage of over 20 European countries. The cost of the package is from 99 to 249 Euro depending on the contents (number of maps included and optional Bluetooth GPS receiver). For this price you receive all the essentials to get you going. Now, if you are in for some extras, TomTom surely has something to offer. If you are willing to pay a little on top, that is. Traffic information makes sure you don't get stuck in traffic jams for ages, while speed trap alerts reduce the chances of receiving a speeding ticket. A whole load of additional points of interest can also be purchased as well, if you want to make sure you're on top of all the interesting places in the vicinity. Be it restaurants, train stations or football grounds, you will be able to visit them all. Just a few clicks and the Navigator will guide you there in no time. The Navigator 6 also offers additional voices in case you get bored with the default ones. Whether you prefer a cheerful young voice or a mature and accomplished performer you can purchase and install it effortlessly following the instructions on the manufacturer's website. Even John Cleese's voice is available if you happen to like him. Other available extras, or PLUS Services as the guys at TomTom call them, include weather forecasts and an audiobook reader. Additional color schemes are also available, as well as QuickGPSFix, which basically adds assisted GPS. This will help your device achieve quicker initial satellite lock. A particularly interesting feature we found is the Routes, which is actually a database of roads with great views. It is not the most useful of features but a bunch of breathtaking views would surely be appreciated by those willing to add some excitement to their trips. Anyway, all these are just extra features, nothing you cannot live without. So, buying them or not won't really have an impact on performance. Next in line is Garmin. Another leading GPS navigation hardware and software manufacturer, it is no wonder the company offers one of the most complete and advanced GPS navigation solutions for mobile devices. 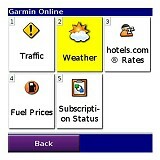 Garmin Mobile XT is fully functional navigation software, which comes complete with City Navigator NT maps. It is compatible with all smartphones and PPC, and even laptops. There is even a dedicated version for the business-minded RIM Blackberry users. It is also worth noting that the City Navigator NT maps database is one of the richest in content, offering detailed maps for quite a large number of countries and a plethora of points of interest. In addition to the turn-by-turn voice guidance, Garmin Mobile XT also offers Traffic information, weather forecasts and a whole bunch of other cool features. 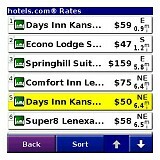 There is information about gas prices, hotel rates and availability, and so on. These are all accessed through your phone, so you'll have to pay for data transfers. Having an unlimited data subscription plan will sure come handy. 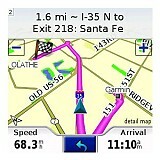 A really cool extra of Garmin Mobile XT is the PeerPoints feature. It allows text messaging your position to other phones, as well as navigating to the location of any other users in your group. Advertised as a perfect feature to keep track of friends and family in a theme park, we are more than convinced that it can do much more than that. The cost of the package is between $99.99 and $199.99 for a one-year subscription. The $200 package also includes a Bluetooth GPS receiver. The subscription duration is only applicable to the network based services, such as traffic info.